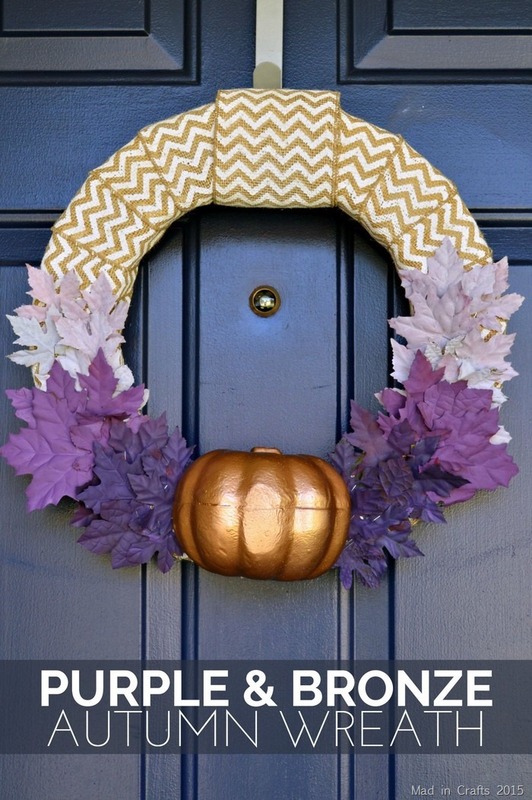 I have done traditional-looking front porch decorations the past two years. Since I am not doing much decorating indoors this year, I decided to go a bit out of the box with out front porch décor this fall. 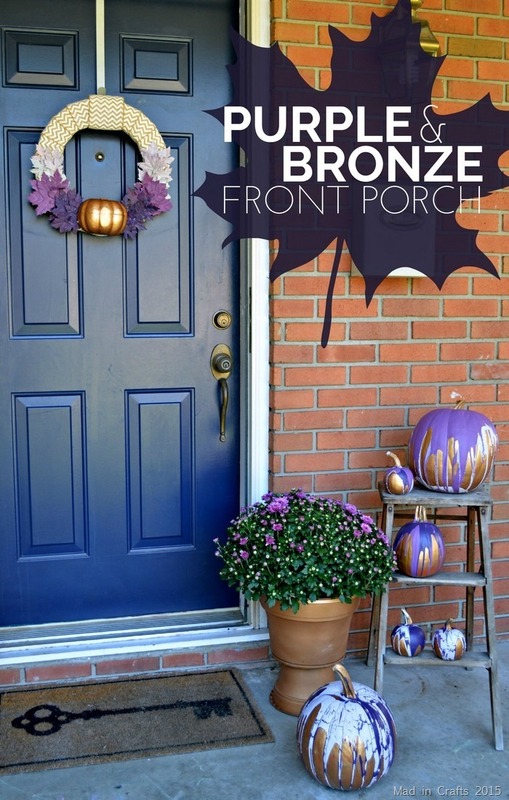 Instead of sticking to tried and true warm autumn colors, I used BEHR MARQUEE® Interior Paint & Primer to create an elegant and unexpected color scheme for our front porch. 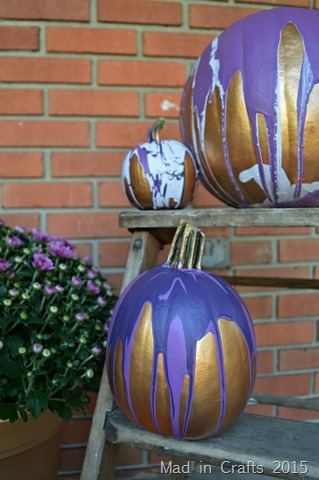 You don’t need any crafty or artistic skill to make yourself a set of these eye-catching purple and bronze ombre paint drip pumpkins. First, I gave all the pumpkins a coat of Third Place Metallic so that they would match the bronze pedestal planters that I made last year. 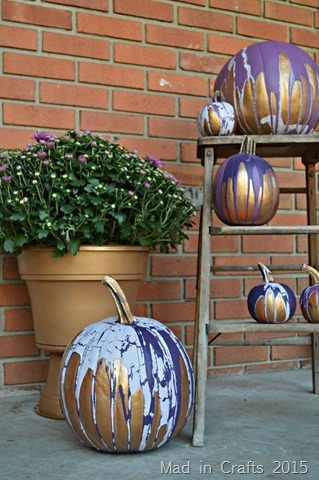 I bought new purple mums to put in the planters, so I thought I would coordinate my pumpkins with the planters. 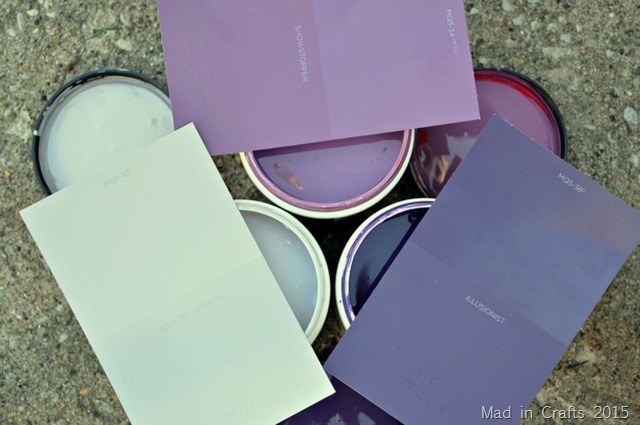 I picked up three sample sizes of MARQUEE Paint and Primer in shades of purple. 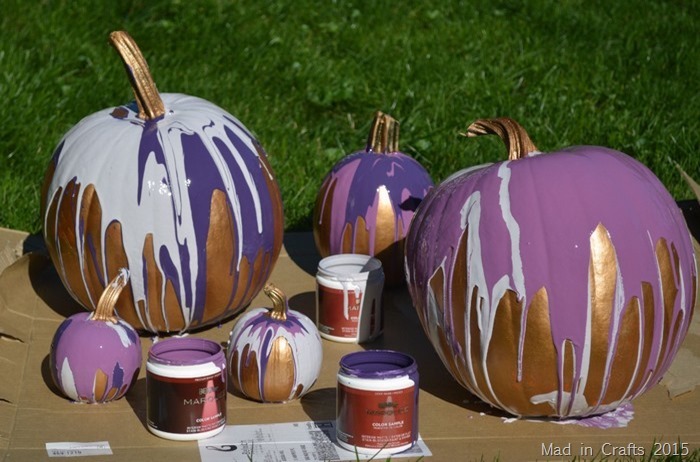 Illusionist is the darkest purple, the medium shade is called Showstopper, and the pale violet color is called Such Melodrama. 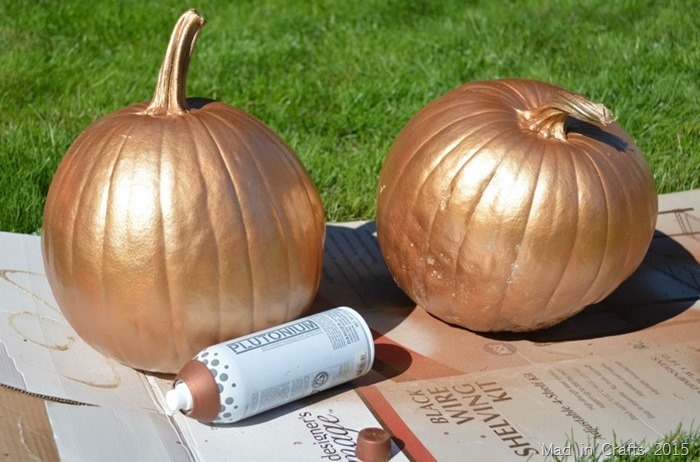 After the spray paint was dry, I began to pour the paint around the stems of the pumpkins. I was able to partially control the flow of the paint drips by slowing tilting the pumpkins as the paint slid down the sides. 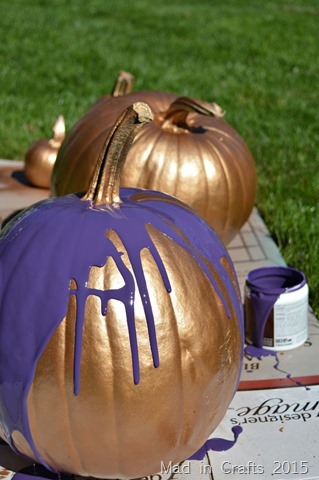 Obviously, you will want cover your floor or lawn before you start pouring the paint. I was having so much fun with the paint, that I decided to create ombre looks like I did with my paint drip pots earlier this year. 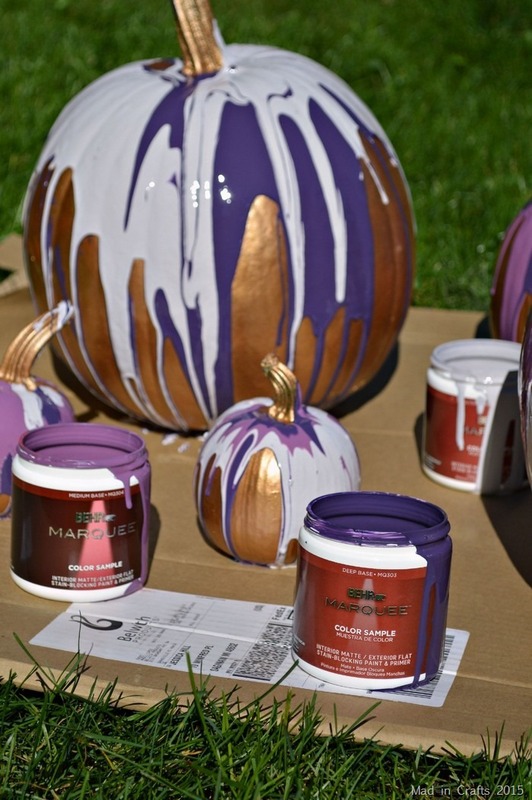 I used two paint colors on the larger pumpkins, and all three on each of the small pumpkins. 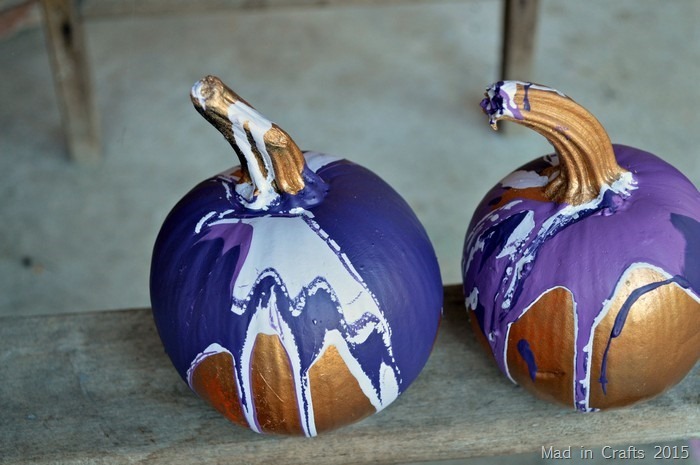 The paints swirl and slosh to make such pretty patterns. BEHR Marquee has a very nice texture for this project. It’s less thick than craft paint, so it pours beautifully. 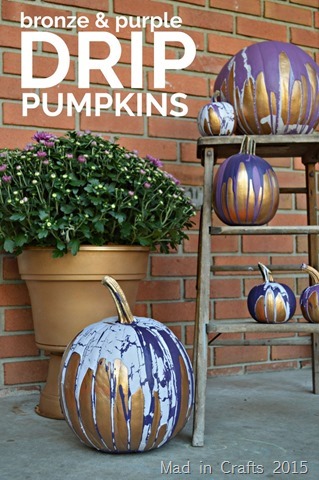 I let the pumpkins dry for a few hours and then added them to my front porch display. Some of the lightest purple paint crackled as it dried, since I forget to stir that sample before I used it. I *love* the crackles, though, so it was a happy accident. I really like the way the spray painted bronze stems peek out of the poured paint too. I think our porch is going to look so nice once all those mum buds turn into big beautiful purple flowers. Have you ever tried a less-than-traditional color scheme for your fall decorations? 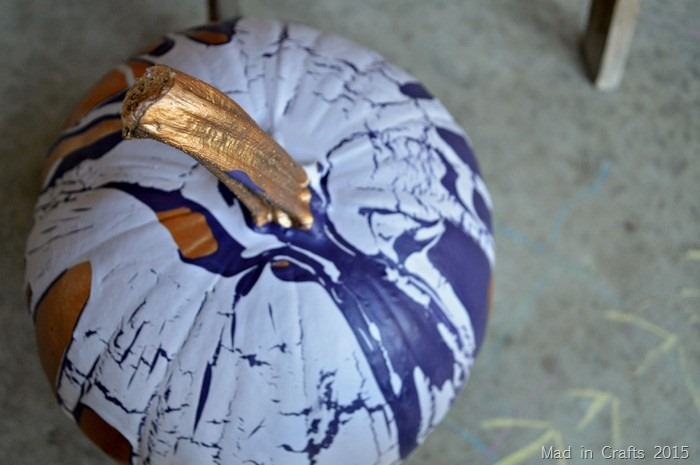 I like this combination so much that I have one more project to show you, so keep an eye out for it!